Making supplemental income is easier than you think! 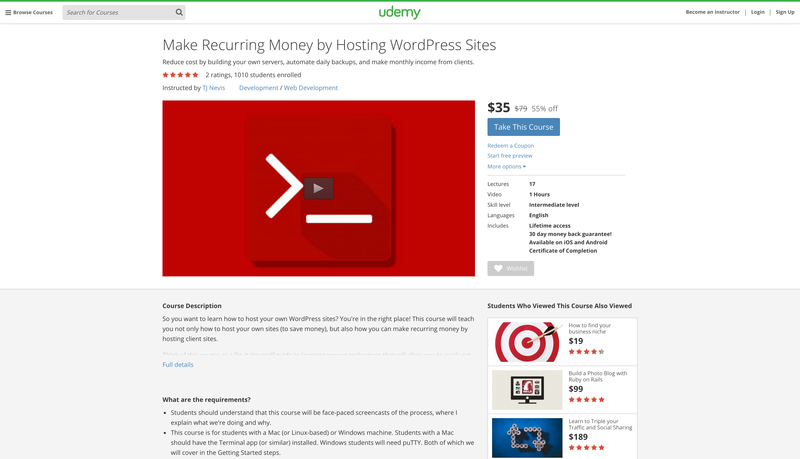 Whether you've built a VPS server before or you're looking to offer your clients web hosting, there will be plenty of proven techniques to learn from this course. Each lesson has a worksheet with the links and commands discussed in the corresponding video. This isn't a theory course, these are techniques that I use to create income every month with hosting a client site. Standardizing and automating tasks makes a team of one seem much larger. I'll teach you how to automate setting up a server in a couple of minutes and implement daily backups. Have your business work for you instead of relying on you. Save money by doing it yourself. Don't pay for those expensive all-inclusive web hosts or hosting add-ons. Each lesson has a worksheet of the resources and commands discussed. Fantastic Course - I found the course quite educational with a no nonsense approach. Just the facts, no fluff and pacing was great. Awesome course !!! - If you want to make money, this is the course you need. TJ will explain you step by step all you have to do to have a profitable business.